PicoScope USB Digitizers accepteren electrische signalen in de frequentierange van DC tot 1 GHz, sample ze tot 5 GS/s en converteer ze naar een 8–bit digitale waarde. De gemaakte data kan gebruikt wordne in zeer veel verschillende toepassingen waaronder onderzoek, ontwikkeling, storing zoeken en testen. 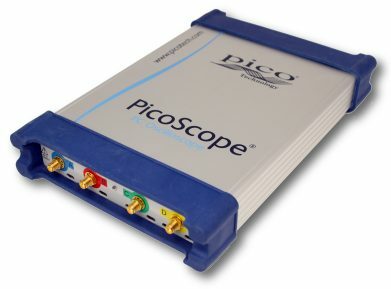 PicoScope 6000 series Digitizers heeft vergelijkbare mogelijkheden en specificaties als traditionele digitizers, maar zijn goedkoper, gebruiken vele minder ruimte en het gebruik van USB zorgt dat u geen spciaal mainframe meer nodig heeft. The PicoScope 6407 Digitizer is a compact USB plug–in device that turns your PC or laptop into a 4–channel, high–speed digitizer. With a PicoScope 6407 you can easily digitize a 1 GHz sine wave with a timing resolution of 200 ps. Your PicoScope 6407 digitizer has a memory depth of one billion samples. Other digitizers have high maximum sampling rates, but without the deep memory of the PicoScope 6407 they can’t sustain these rates on long timebases. Your PicoScope 6407 can sample at 5 GS/s at timebases all the way down to 20 ms/div, giving a total acquisition time of 200 ms. If that’s not enough, the driver supports streaming mode for capturing unlimited gap–free data directly to your PC’s RAM or hard disk at over 10 MS/s. The large buffer enables the use of segmented memory. Each captured waveform segment is stored in the buffer so you can rewind and review thousands of previous waveforms. No longer will you see a glitch on the screen only for it to vanish before you stop the scope. As well as the standard range of triggers found on all oscilloscopes, your PicoScope 6407 offers a comprehensive set of advanced triggers including pulse width, windowed and dropout triggers to help you capture the data you need. USB–connected. Why make things difficult? At Pico we are committed to providing value for money. That’s why when you buy a PicoScope 6407 USB Digitizer you don’t just get a digitizer. Using the power of the supplied PicoScope software you can use your PicoScope 6407 as a 4–channel, 1 GHz oscilloscope with a voltage range of -100 mV to +100 mV. Alternatively you can use the spectrum analyzer function in PicoScope for recording measurements in the frequency domain. But that’s not all… Your PicoScope 6407 also includes a built–in function generator and an arbitrary waveform generator (AWG) with a 16,000 sample buffer. Your PicoScope Digitizer comes with a software developement kit (SDK) that includes drivers for Windows–based PCs and example code for various programming languages and third–party software such as LabVIEW. Using the SDK you can develop your own programs to collect and analyse data from the digitizer. At Pico we don’t do “optional extras”. Other companies may think that you should pay for high–end features such as mask limit testing, serial decoding, advanced triggering, automatic measurements, math channels, XY mode, digital filtering and segmented memory. We don’t. When you buy a PicoScope Digitizer everything is included in the price. With 4 channels, 1 GHz bandwidth, 1 GS buffer size and 5 GS/s real–time sampling, a USB–connected PicoScope 6407 Digitizer gives you the power, performance and portability you need at a price you can afford.